Following a vision of the future, where the Doctor witnesses the assassination of the President of Gallifrey, he travels back to his home planet hoping to prevent these events unfolding. When the Doctor lands he is greeted by guards who try to arrest him. The more the Doctor tries to change history the more it looks like he is the guilty party. Could this really be the case or are events being controlled by an unseen other...? 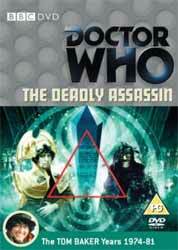 The Deadly Assassin is a four part, fourteenth season Tom Baker story, directed by David Maloney from a script by Robert Holmes and is one of the very few stories where the Doctor does not have a companion. There is also has some infamy here, as the scene of the Doctor being drowned drew the full fury of Mary Whitehouse, resulting in the BBC agreeing to cut some of the footage and the show was only transmitted in its original form once. Okay, so this was going to be the show which proved once and for all if Tom Baker could carry a whole story without the support of a companion. Of course Baker’s performance is expansive enough to carry the show on his own, was there any doubt? This story also opened up Gallifrey as a society, in a way that no previous story had done, and set down much of the canon on this planet, which stepped on more than one preconception - a move that was greeted with as much enthusiasm as consternation. Personally, I enjoyed the baroque look. With the president assassinated the Doctor has to follow his unseen nemesis. Okay, it’s the Master - but then the show doesn’t do a great job of hiding the fact - this time played by Peter Pratt, behind an effectively grotesque mask. Apart from Tom Baker, the show also was able to boast strong performances by Bernard Horsfall as Chancellor Goth, George Pravda as Castellan Spandrel, Angus Mackay as Cardinal Borusa, a character that would remain important in Who lore and Hugh Walters hamming it up as Commentator Runcible. Is it me or are the extras on the Doctor Who discs getting thinner. This disc comes with a combination of good and slightly odd extras. First up is a full length commentary with Tom Baker, being his usual and exuberant self ably supported by Bernard Horsfall and producer Philip Hinchcliffe. The extras proper kick off with The Matrix Revisited (29 min, 16 sec) - cast, crew and critics look back at the making of the story in this documentary from Paul Vanezis. With actors Tom Baker, Bernard Horsfall, producer Philip Hinchcliffe, director David Maloney, designer Roger Murray-Leach, founding president of the Doctor Who Appreciation Society Jan Vincent-Rudzki, and the founder of the National Viewers' and Listeners' Association Mary Whitehouse. The feature is narrated by Sara Griffiths. Next up is one of those oddities, in the shape of The Gallifreyan Candidate (10 min, 30 sec) - this featurette from Dene Films looks at Richard Condon's novel The Manchurian Candidate, adapted in 1962 into a film thriller starring Frank Sinatra, which is often cited as being a major influence on the plot of The Deadly Assassin, with Newcastle University's Stacy Gillis and Oxford University's Andrew Shail. To be honest the feature is more about the book and film than it is about Doctor Who. although it may well have been an influence, I’m not convinced that its influence was extensive enough to warrant a feature. The last large feature on the disc is The Frighten Factor (16 min, 36 sec) which takes a look at what factor or factors makes Doctor Who frightening. It is presented by Brendan Sheppard with contributions from Barry Letts, Terrance Dicks, Lucy Lewis (educational psychologist), church minister Peter Cavanna, Doctor Who Magazine's editor Tom Spilsbury and assistant editor Peter Ware, Doctor Who Adventures magazine editor Moray Laing and head writer Annabel Gibson, writer John Dorney, television archivist Jim Sangster and Doctor Who expert Alex Lydiate. The whole thing is narrated by Simon Ockendon. The disc is rounded up with the usual Radio Times Listings, production notes, a photo gallery and the 'coming soon', this time for Delta and the Bannermen. The story is presented in its original 4:3 aspect ratio and the restoration team have done another sterling job of presenting the show in its best possible light. They have even been able to substantially put back the drowning sequence at the end of episode three. Thanks chaps.